Macclesfield Town Centre will be visited next month nine 9 well-known Star Wars characters – as part of the international Star Wars Day celebrations. Organised by Macclesfield Town Council, visitors to the Town Centre on Saturday May 4th from 10am until 4pm, will be able to enjoy meeting some of their favourite Star Wars friends (and enemies) and having their photograph taken with them. 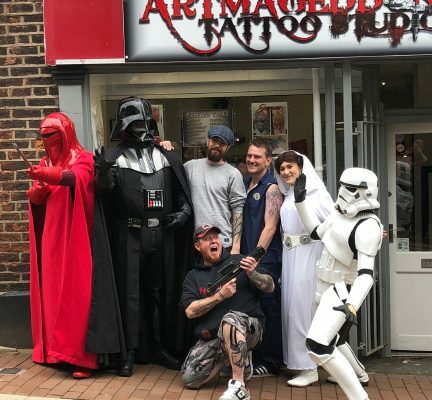 The force must be strong in Macclesfield as this follows on from the success of last year’s Star Wars Day when 4 characters visited the town centre bringing some fun to the faces of families, customers and retailers. For more information, please call Macclesfield Town Council on 01625 374142.